This April, the Auto and General Theatre on the Square proudly presents a three week season of DUNCAN BUWALDA’s acclaimed historical comedy-drama HINTERLAND. The play is about the (fictional) meeting of two giants of South Africa that could have changed the course of our history. Deeply controversial at present and more than a hundred years after his death, Cecil John Rhodes still enjoys fame and notoriety, as Southern Africa’s arch-imperialist – while the multi-talented man of letters, Sol Plaatje, was one of the ANC’s founding fathers in 1912. In 2012 HINTERLAND was selected for the finals of the PANSA / NLDTF Festival of the Reading of New Writing in Durban. Veteran Director CAROLINE SMART took the helm, and the staged reading won three awards: Runner-up, Audience Choice and Best Director. The play was selected for the Arena Programme of the 2013 National Arts Festival – one of only two South African plays to make the cut – and enjoyed a successful run. 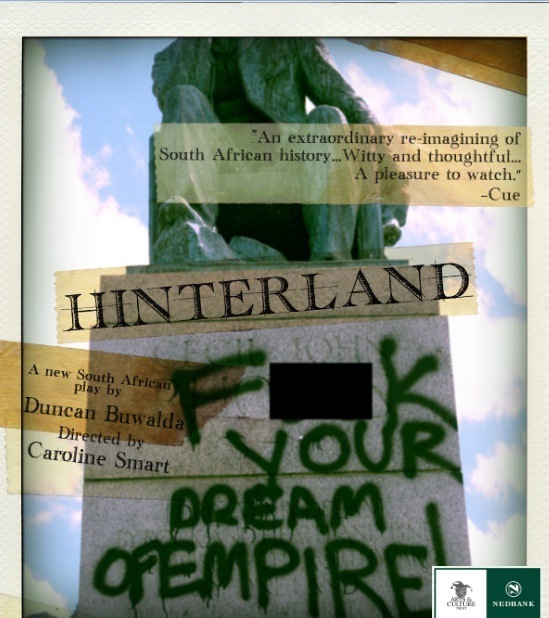 HINTERLAND enjoyed a successful return season to Grahamstown on the Fringe last year. Cecil John Rhodes is played by DAVID DUKAS, who was most recently seen in Grahamstown as Sir George Grey in Ingrid Wylde’s Princess Emma in 2012. Amazingly, David can claim an ancestor, Pieter Raaff, who knew Cecil Rhodes in the years of Rhodesia’s infancy. The role of Sol Plaatje is played by rising star SIPHO MAHLATSHANA, who was most recently seen in the SAFTA award-winning mockumentary, Armed Response. JEREMY RICHARD (who recently performed in RED at the Auto & General Theatre on the Square) appears in HINTERLAND as Colonel Robert Kekewich. This garrison commander of Kimberley, ends up locking horns with the strong-willed Rhodes. The cast is completed by veteran Durban-based actor FRANK GRAHAM, as Rhodes’s personal physician, Doctor Thomas Smartt. Frank was most recently seen in the Playhouse Company’s production of West Side Story last Christmas. DUNCAN BUWALDA’s 2011 Grahamstown debut, Dream, Brother, directed by Tara Notcutt, won the Standard Bank Silver Ovation Award for Drama and enjoyed a successful return season to Grahamstown in 2012. With extensive experience in all aspects of the performing arts, director, CAROLINE SMART is the recipient of four Lifetime Achievement awards, including one from The Mercury Durban Theatre Awards Panel. Recent protest action by UCT students over a statue of Rhodes at the university has proven in dramatic fashion that Rhodes and his legacy are still hot topics in the South Africa of 2015. Come to Sandton to see him and another iconic South African as they were: flesh and blood men with dreams and differences, doing what they thought was best for the country.